What does it take to inspire joy and bravery in others? Portland artist, business consultant and Northwest Academy parent Gary Hirsch thinks it might be as simple as a domino and some pens. Hirsch, 50 years old with a smart and witty personality, began using these materials in 2010 to start an art project called Botjoy. 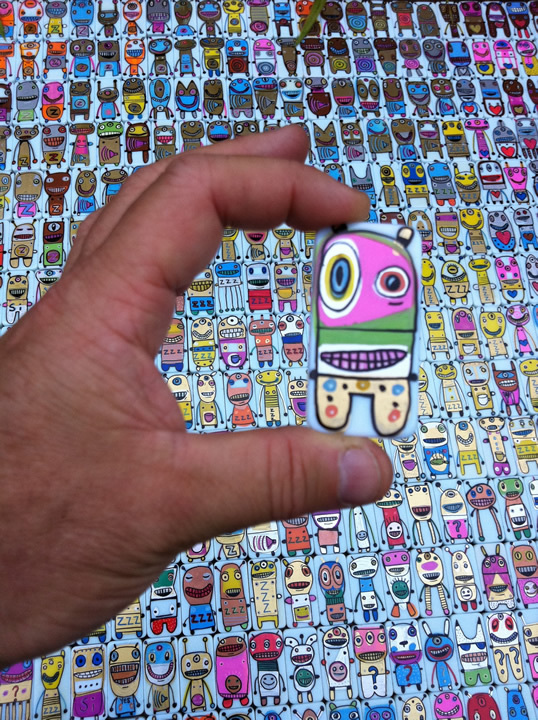 He began to make bots, small, painted figurines meant to inspire conversation. The bots also include questions and instructions that try to stimulate thought and introspection. In order to make a bot, Hirsch simply draws a robot character on the blank side of a domino using pens. His illustrations are bright and colorful and make his figures fun to look at or play with. Hirsch has made a variety of bots, each with a different theme that can be distinguished by the illustration on it. “You can use any type of pen that would stick to a domino,” Hirsch said. “The only other thing that you have to think about is ‘what’s the design that represents your idea?’” Hirsch said. The idea of the bots began as a gift from Hirsch’s consulting company, On Your Feet. Hirsch began expanding the idea and starting making different versions of the bots. “I made Brave Bots and I donated them to a children’s hospital because I thought ‘Well, who needs something like that, who needs a little bit of help?’” Hirsch said. The bots have become very popular and even stars such as Ryan Gosling and Breaking Bad’sR.J. Mitte have received them. However, even with all of the success, Hirsch insists that anyone who is interested make a bot. Instead, Hirsch started the project that encouraged others to use his idea. People have even marketed his idea. Although Hirsch does have an Etsy where he sells his bots on occasion, it is not always possible to get a bot by simply buying one. Hirsch prefers that people get them in more creative ways, such as finding them around their city. In 2013, Hirsch had the opportunity to do a TEDX talk on his idea. Although creating the bot is as simple as a domino and a pen, Hirsch believes that it takes more effort than that to truly make a bot. Hirsch’s idea has been used by elementary classes which were inspired by the idea of helping the community. Different grades in the school also made Discovery Bots, which go on to be intended for scientists and astronauts, as well as Silly Bots for people who need some fun. Hirsch’s bots have not only inspired other people but his family as well. Despite being an important part of his life, the bots are a passion project. Hirsch spends his working hours with his consulting company, using improv to help businesses succeed. On Your Feet has worked with big companies such as Nike, Intel and Apple. Hirsch strives to teach employees to be creative, engaging and collaborative in a fun, friendly environment. Hirsch began by teaching a course at Portland State University, but soon realized that there was a business in his idea. Now his business has spread with employees in New York, as well as partners in Europe. Hirsch used the commission to create 18 panels, each with a different multicolored fish painted on them. He is proud of the final product and the response it received. The piece has been recognized and appreciated by those in the Northwest Academy community. “When I found out that Emma’s dad Gary did the fish thing it was such a big moment for me because we used to park in that garage when I was a kid, and it would be a big deal which fish we parked next to,” Grace Ettinger, a freshman at Northwest Academy, said. Hirsch’s passion for art developed at around the age of five when he had intense nightmares. Hirsch and his dad would name the monsters and talk about them. His dad also encouraged him to erase his drawings, as a symbolic way of controlling his nightmares. Over time, Hirsch found his nightmares going away. “So I drew monsters and creatures and things like that ever since I was five, and they’ve almost served the same purpose, which is they help me deal with stuff.” Hirsch said. Hirsch had some advice for anyone trying to start their own project. While helping scores of other people, Hirsch’s bots have also been able to help him.